He may be almost 5,000 miles from the thick of the action but Edinburgh City are never too far away from club stalwart Dougie Gair’s thoughts. Having reached the decision to hang up his boots 18 months ago following 13 years with the Capital outfit and embark on a new life out in Dubai, Gair is very much now a supporter from afar. Admitting to have been somewhat taken aback at just how well City have fared this season, the 33-year-old insists it was never the club’s intentions just to live off the plaudits of being the first club to be promoted via the Pyramid system in 2016 – Gair making a little bit of history by scoring an 87th-minute penalty that saw Lowland League champions City swap places with East Stirlingshire in Scottish football’s fourth tier. Fast forward two and a half years and City are once again embroiled in a promotion hunt, this time to Ladbrokes League One. “As soon as we were promoted in 2016 a plan was put in place,” said Gair, who has sinced assumed a manager’s role at a top golf complex in Dubai. “They definitely want to keep improving and getting better and hopefully they can get promoted again this season. The long-term ambition is to be in the leagues and grow the club and not just settle for mediocrity. “It really is some season they are having this year so fair play to them. “Obviously there have been massive changes and the players they have brought in are of a better standard than when I was there but it’s great to see. I keep a close eye on things out here and I’ve managed to see a couple of games this season with them being on TV. “It’s crazy to think how far the club has come in such a short space of time. I think in our first season in the Lowland League we finished eighth. It’s unrivalled what the club has managed to achieve because so far City are the only club to have been promoted. “I still talk to a couple of the guys who are still there too. We chat about it and messages are sent on WhatsApp on a Saturday about the result so we’ve all still got a massive affection for the club, none more so than myself. “We were split up as a squad not long after getting into SPFL League Two so it might have been quite interesting to see how that group would have done. But things change in football. You just have to be ready for it to happen. It was great to go to the pub after the game like we used to do, just like a group of mates, but you have to have that professional aspect. 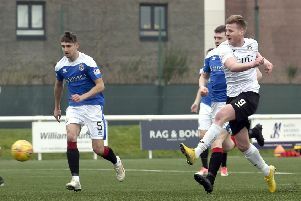 James McDonaugh’s men were knocked off the top earlier this week by Peterhead who won their game in hand against Cowdenbeath to move two points clear. 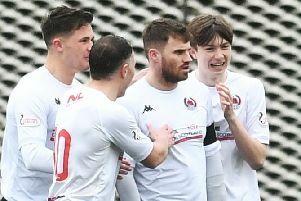 With a trip to Clyde tomorrow beckoning for City, the Broadwood outfit just a further two points back, Gair says it couldn’t be tighter heading towards the business end of the season.